“Young presents a brilliant account of how the voice has been preserved, transformed and even imagined in relation to technology. The 13-page list of electro-vocal pieces alone is a superb resource.” – Dr Elizabeth Dobson for Times Higher Education. “Young provides a necessary exchange between scholarly knowledge and creative practice…. what is voice, what is it? The book insightfully and imaginatively highlights this critical question by cutting, repeating, scratching, and reassembling it. It indeed sings the body electric through its conversations.” – Dr Zeynep Bulut in Twentieth-Century Music. 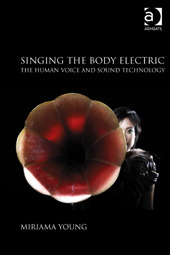 Singing the Body Electric explores the relationship between the human voice and technology, offering startling insights into the ways in which technological mediation affects our understanding of the voice, and more generally, the human body. From the phonautograph to magnetic tape and now to digital sampling, Miriama Young visits particular musical and literary works that define a century-and-a-half of recorded sound. She discusses the way in which the human voice is captured, transformed or synthesised through technology. This includes the sampled voice, the mechanical voice, the technologically modified voice, the pliable voice of the digital era, and the phenomenon by which humans mimic the sounding traits of the machine. The book draws from key electro-vocal works spanning a range of genres – from Luciano Berio’s Thema: Omaggio a Joyce to Radiohead, from Alvin Lucier’s I Am Sitting in a Room, to Björk, and from Pierre Henry’s Variations on a Door and a Sigh to Christian Marclay’s Maria Callas. In essence, this book transcends time and musical style to reflect on the way in which the machine transforms our experience of the voice. The chapters are interpolated by conversations with five composers who work creatively with the voice and technology: Trevor Wishart, Katharine Norman, Paul Lansky, Eduardo Miranda and Bora Yoon. This book is an interdisciplinary enterprise that combines music aesthetics and musical analysis with literature and philosophy.